The Doberman Pinscher was developed in Germany toward the end of the 19th century. The Germans wanted to create a functional protection and guard dog that would also serve as a family companion. Dogs were selected for their courage and intelligence. 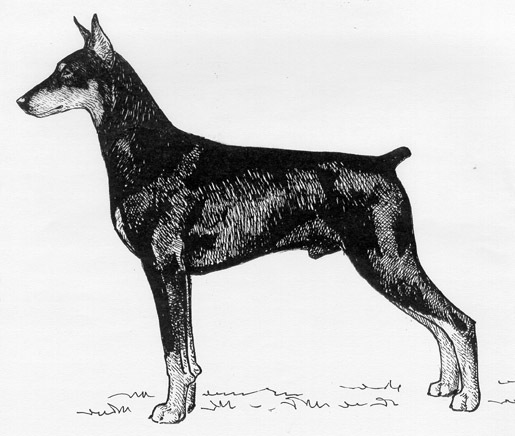 One of the most well-known early breeders was Louis Dobermann, from whom the breed takes its name. It is uncertain how many and exactly which breeds were used to create the Doberman Pinscher. Most authorities include the Rottweiler, the old (and now extinct) German Shepherd, the German Pinscher, the Manchester Terrier, and the Greyhound. What is certain is that the breed assumed its present appearance fairly rapidly and was recognized by the German Kennel Club in 1899. Dobermans began to appear in large numbers in the United States after World War I. The breed has been a successful working dog and a popular companion, excelling in police and military work. The breed has been recognized by the United Kennel Club since the 1940's. The Doberman Pinscher is a square-bodied, smoothly-muscled, elegant dog of medium size with a short coat. The head is wedge-shaped with high-set ears that may be cropped or hang naturally. The naturally arched neck flows into smooth shoulders, which continue into a strong straight topline, continuing on to the tail which appears to be a continuation of the spine. The length of the head, neck and legs are in proportion to the length and depth of the body. The Doberman Pinscher comes in four colors with rust markings. The appearance of the Doberman Pinscher should convey power and elegance. Early Doberman Pinschers were noted for their "sharp" temperaments, but decades of careful breeding has produced a nearly ideal all-round working dog, intelligent, brave and loyal. Dobermans are alert and watchful dogs, and fearless when threatened with danger. Dobermans are energetic dogs, particularly when young, and benefit from regular training and exercise from the start. With high intelligence and confidence comes determination, so a Doberman owner must be prepared to be patient, firm and consistent in training. Dobermans excel in performance events, particularly in obedience and protection work. The head is long and dry, forming a blunt wedge when viewed from the front or side. Viewed from the front, the head gradually widens toward the base of the ears in a practically unbroken line. When viewed from the side, the skull and muzzle are equal in length, parallel to one another and joined by a slight, gently sloping stop. The skull is flat and of moderate width. Cheeks are flat and muscular. In profile, the muzzle should not slant back too suddenly from under the nose. Jaws are full, powerful and well filled under the eyes. Lips are tight and dry. A full complement (42) of correctly placed, strongly developed teeth (22 in the lower jaw and 20 in the upper jaw) meet in a true scissors bite, lower incisors upright and touching inside of upper incisors. Discolored teeth are not to be penalized. Disqualifications: Overshot more than 3/16 of an inch; undershot more than 1/8 of an inch; three or more missing teeth. Solid colored. The nose is black in black dogs, dark brown in red dogs, dark gray in blue dogs and dark tan in fawn dogs. Eyes are almond shaped, and moderately deep set. Eye colors range from medium to dark brown in black dogs. In blue, red and fawn dogs, the color of the iris should blend with that of the markings. Darker shades are always preferred. Faults: Light, round or prominent eyes. Cropped or uncropped equally acceptable. The cropped ear stands erect, set high enough on the head so that the inner attachment of the ear is level with the top of the skull. The uncropped ear is medium sized, triangular in shape and set high on the skull. The ear flap lays flat against the sides of the head. Faults: Uncropped ears that fold improperly and stand out to the sides; fully erect uncropped ears. The neck is smoothly muscled and well arched, widening gradually from the nape to the shoulders. Skin of throat is tight, free of dewlap. When the dog is standing, the neck is carried proudly with the head held high. Shoulder blades slope forward and downward at a 45-degree angle to the ground, meeting the upper arm at an angle of 90 degrees. Length of shoulder blade and upper arm are equal. Height from the elbow to the withers approximately equals height from the ground to the elbow. When seen from the front or side, the legs are perfectly straight and parallel to each other from the elbow to pastern. The legs are well muscled and sinewy, with round, heavy bone proportionate to the body structure. Whether standing normally or moving, the elbows lie close to the brisket. Pasterns are firm and are nearly perpendicular to the ground, only slightly sloping. Viewed in profile, the body is compact and square. The ribs extend well back, and are well-sprung from the spine, then flattening to form a deep body extending to the elbows. Viewed from above, the width of body at the point of shoulders and width of the muscles over the hips should be about the same. Withers are pronounced and form the highest point of the topline. The back is short, firm, level and moderately wide. The loin is short and muscular, but narrower than the rib cage. The croup is broad, muscular and slightly rounded. The topline extends in a straight line from the top of the withers to the top of the slightly rounded croup. Viewed from the front, the chest is deep, well filled in, and broad, allowing the brisket to extend down to the elbows without being pinched. Viewed from the side, the forechest is well defined, extending just slightly beyond the point of shoulder. The underline is formed by a brisket reaching deep to the elbow, flowing back parallel to the ground to the base of the eighth or ninth rib, then ascending and gradually shortening to give a marked tuck-up, and flowing into a short loin. Faults: Exaggerated "ski slope" topline; exaggerated tuck-up. The angulation of the hindquarters is in balance with the angulation of the forequarters. The hip bone slopes downward from the spinal column at an angle of about 30 degrees, producing a slightly rounded, well-filled-out croup. Femurs are set at right angles to the hip bones. The upper thighs are long, wide and well muscled on both sides. Upper and lower thighs are of about equal length. Stifles are clearly defined. While the dog is at rest, hock to heel is perpendicular to the ground. Viewed from the rear, the legs are straight and parallel to each other. The rear pasterns are well let down and perpendicular to the ground when viewed from any angle. The feet are well arched, compact and catlike turning neither in nor out. Dewclaws are generally removed. Tail is generally docked at approximately the second joint, and appears to be a continuation of the spine. The tail is carried only slightly above the horizontal when the dog is alert. The natural tail is ideally carried high in a slight curve. Fault: Gay tail or terrier tail. The coat is short, hard and thick. It is smooth and close lying. A barely visible gray undercoat on the neck is permissible. There are four allowed colors: black, red, blue and fawn (Isabella). Blue is a dilute of black. The "fawn" color is a dilute of red, and is a silvery beige color, more like the color of a Weimaraner than the traditional fawn found in Boxers or Great Danes. Markings are rust colored, sharply defined, located above each eye and on the muzzle, throat, forechest, all legs and feet, and below the tail. A small white patch on the chest, not exceeding square inch is permissible. Faults: Large, splashy markings; light or indistinct markings; absence of markings; markings that bleed into the solid color; white patch exceeding square inch. Disqualifications: Any color other than listed above, albinism. The Doberman Pinscher is medium in all aspects of its physical characteristics. Ideal height in a mature male is 27 inches, with 26 to 28 inches being acceptable. Ideal height in a mature female is 25 inches with 24 to 26 inches being acceptable. The ideal Doberman Pinscher must have sufficient size and bone for strength and endurance but not so much as to impair its speed and agility. When trotting, the gait is effortless, smooth, powerful and well coordinated, showing good but not exaggerated reach in front and drive behind. When moving, the dog's head is carried forward, not upward. The topline should remain firm during movement and there should be no sideways swinging of the ribcage or rolling over the shoulders. Viewed from any position, legs turn neither in nor out, nor do feet cross or interfere with each other. As speed increases, feet tend to converge toward center line of balance. Overshot more than 3/16 of an inch. Undershot more than 1/8 of an inch. Three or more missing teeth. Any color other black, red, blue or fawn (Isabella).